We know it’s hard to start preparing your home for winter and thinking about furnace maintenance when the air conditioner is still running. But, remember, this is Kansas City where we can experience two seasons in one day. You can do most of these seven easy steps yourself to prepare your home for winter, all of which will help lower your utility bills and protect your investment in your home. 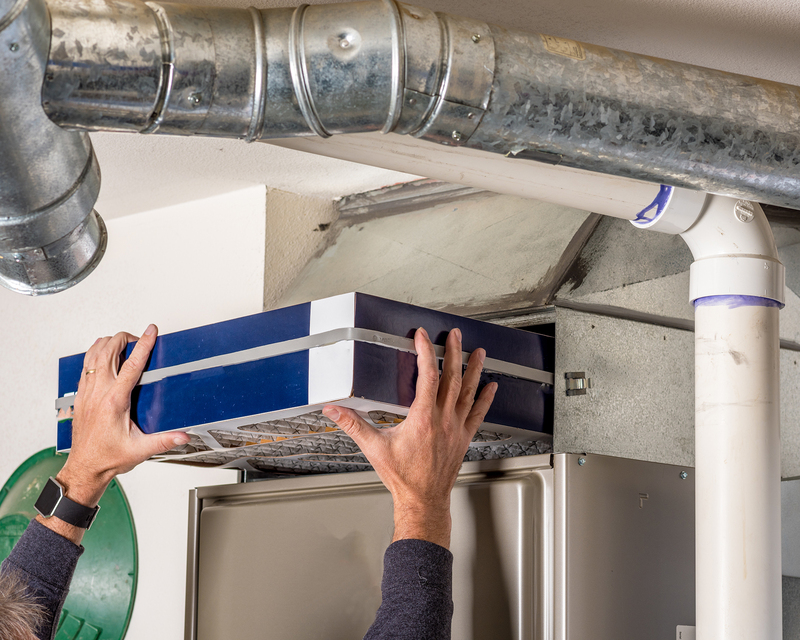 Even better, annual winterizing and furnace maintenance can put off or avoid spending more money on replacing unmaintained systems. Let’s begin with the really easy ones that the majority of homeowners handle on their own. When the season changes, change your air filter. Depending on whether you have pets, family members with allergies or recently underwent a home project that produced a lot of dust, you should change the air filter more frequently. This one simply thing can extend the life of your HVAC system. Make sure the arrow marked on the air filter is facing toward the furnace and away from the return duct that carries the heated or cooled air throughout your home. Make it a fall habit to change the batteries in your smoke detectors and carbon monoxide detectors and test each afterward. The news carries too many stories each fall about families who suffer from carbon monoxide poisoning and home fires when the weather turns cold and heaters turn on. Your ceiling fans should help redistribute cool and warm air and make your home more comfortable – IF they are rotating the correct way for the season. Fans should rotate clockwise in the winter to pull down warm air from the ceiling (heat rises) and counter clockwise in the summer to circulate cool air (cold drops). Do this BEFORE the first freeze to prevent water from freezing in the pipes, splitting them and creating leaks in your basement. Drain water from the hoses and bring them indoors since water freezing in them causes splitting and damage. The next two to-dos to prepare your home for winter might require professional help, depending on your comfort level. So many Kansas City neighborhoods are home to big, stately trees – beautiful to watch change color, a disaster waiting to happen when they clog your gutters. After the majority of leaves have fallen off the trees, it’s time to clean the gutter, as well as inspect the downspouts and clear any blockages. Clogged gutters and downspouts can reroute rain, snow and ice run-off. In worse case scenarios, water leaks through the roof and into your home. If you have a humidifier on your furnace, it is a good idea to clean and adjust it before turning on the heat. Replace the old filter, open the air damper if you closed it for summer, and turn on the water valve. All this can be done by your Chief Heating & Cooling service technician when servicing your furnace, which brings us to the last to-do. Last, but not least, this should only be performed by an experienced, qualified technician. It’s worth a few dollars to have a professional service technician from Chief Heating & Cooling clean, repair and examine your heating system before that first cold day of winter. Heating systems will use fuel more efficiently, last longer, and have fewer problems if properly serviced. Ready to winterize your home? This is actually the best time to do it. Our team at Chief Heating & Cooling isn’t inundated with emergency service furnace calls because homeowners haven’t yet switched from AC to heat. Contact us or call us today at (816) 246-4646 and let’s get your home on the schedule.